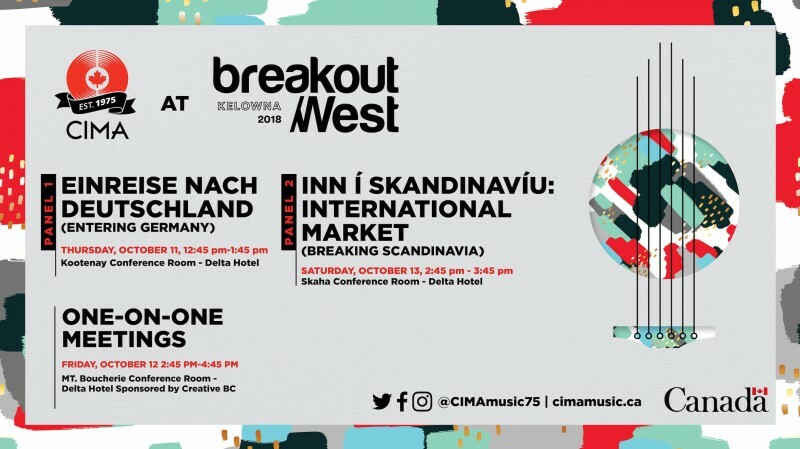 The Canadian Independent Music Association (CIMA) are pleased to be sponsoring two panels and a one-on-one sessions at Breakout West this year in Kelowna, British Columbia. About: Did you know the German market still buys CDs? German industry pros will share key information like this to prepare artists for touring and building success in Germany. About: The Scandinavian Market is a massive 25 million person adventure of epic proportions. These top industry from Scandinavia will share the key factors of the market and how to break in. About: Your opportunity to meet face to face with key industry leaders attending BreakOut West this year. This meeting series proves to be one of the most popular parts of BreakOut West and does tend to fill up in advance of the event. So we encourage you to check it out now. NOTE: You must be a registered delegate to access the sign up for one-on-one meetings. If you have not yet registered click below to complete your registration. For full instruction on signing up for One-on-One Mentor Meetings.